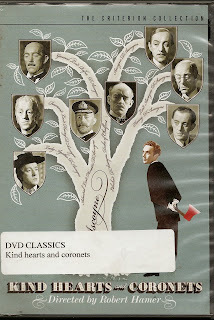 Dennis Price plays Louis Descoyne in this brillant British send up of murder mysteries. He plays 13 parts. Narrated by Alec Guiness,this movie is a gem. When his mother is cast out of the family her son is denied his rightful title of Earl. This leads him to not getting the woman he loves who is only interested in money and power. When his Mother dies he vows to attain his righful place as Earl. To do this he must ingratiate himself with his estranged family. (All played by Dennis Price.) After becoming acquainted with them one by one,he kills them, one by one,each murder bringing himself one step closer to the title he so eagerly covets. When he is accused of the one murder he didn't commit, he is sentenced to hang. Recognizing the irony of it all he proceeds to pen his memoirs the night before his execution. When dawn arrives and with it a Pardon, he joyfully leaves the cell a free man. But a last minute twist of fate, which rivals anything by O. Henry, leaves you with no doubt that crime- while attractive- does not always pay. And things are never quite what they appear to be.